Mr. and Mrs. Anderson were very proud of their new baby boy. They were so proud that they didn’t want him to have just any old name. They wanted him to have a long, important and very special name, so they called him Angus Alan Alastair Alpin Andrew Alban Anderson. He wouldn’t be called Angus. He wouldn’t be called Alan. He wouldn’t be called Alastair, Alpin, Andrew or Alban. He was going to be called by all of his names. One day they wrapped Angus Alan Alastair Alpin Andrew Alban snuggly in his blue blanket and put him into his baby carriage. They took him for a walk to the park. They ran into Mr. and Mrs. Lennox, who were also taking their new baby boy for a walk. 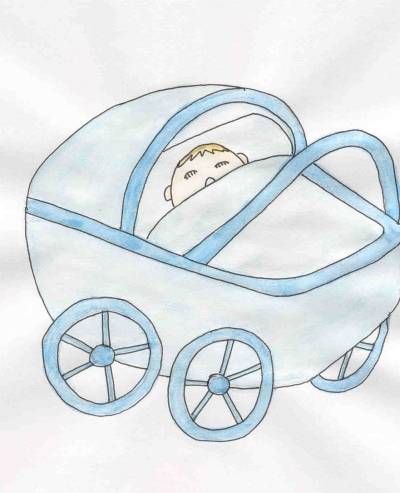 "Oh, hello, Mr. and Mrs. Lennox," Mr. Anderson said, peeking in to the Lennox’s baby carriage. Mrs. Anderson asked, "I see you’ve had your baby too. What’s his name?" Mr. Lennox proudly replied, "Logan." Mr. Anderson snickered softly and said, "How nice. Logan. You can see we have had our baby too. His name isn’t as plain as Logan. We’ve named him Angus Alan Alastair Alpin Andrew Alban Anderson. It’s such a special name for such a special baby boy." Mr. and Mrs. Lennox looked at each other, and then in a huff said, "We like the name Logan. It’s just fine!" and walked away. Mr. and Mrs. Anderson continued on their walk. "Who would call their child something as unimportant and short as Logan?" he asked. He looked at his son and tickled him under his chin. And so it went. Every time they met someone at the park, or at the zoo, or at the playground, they would snicker at the child’s name and walk proudly away with their son. Angus Alan Alastair Alpin Andrew Alban grew up very quickly. Soon he was ready to start kindergarten. Mr. and Mrs. Anderson took their son on the first day of school to meet his teacher. "Good morning. I am Mrs. MacTavish. I will be Angus’s teacher while he is in my class," she said, introducing herself. "Excuse me!" Mrs. Anderson interrupted. "Our son is not to be called Angus. His name is Angus Alan Alastair Alpin Andrew Alban and we insist that he be called that at all times!" All through the school year he went by his whole name. While other children were learning to write their short names, like Moira, Meagan, Shauna and Jamie, Angus Alan Alastair Alpin Andrew Alban had to learn to write his long name. As he grew older, he turned into a handsome young man. Girls began to call him at home. "Is Angus Alan Alastair Alpin Andrew Alban there? Can I speak with him?" they would ask. When his mother and father wanted him to do something around the house they called, "Angus Alan Alastair Alpin Andrew Alban, come here please." Graduation night came. Mr. and Mrs. Anderson were so proud to have their son graduate at the top of his class in high school. The principal handed out the diplomas to each boy and girl as he called their names. "Rhianna, Catriona, Olivia." But before he could say Angus Alan Alastair Alpin Andrew Alban, he had to take a deep breath. Mr. and Mrs. Anderson were so happy. Their son had such a long, important and special name. The other children names were so short and so plain. After college, Angus Alan Alastair Alpin Andrew Alban went out to work. He had a hard time writing his whole name on some of the job applications. He finally found a good job in a tall building. One day he invited his mother and father over to see his very own office. They walked down the halls looking at all the nameplates on the doors. They knew they had found their son’s office when they saw the gold nameplates on his door. They both read out loud, together, "Angus Alan Alastair Alpin Andrew Alban Anderson – Attorney at Law." "Isn’t that such a special name dear?" Mr. Anderson said to his wife. "I am so proud of our son." The day came when Angus Alan Alastair Alpin Andrew Alban met and fell in love with a very special woman. He knew that his mother and father would like her right away. She too had a very long and important name. "Mother, Father, I’d like you to meet my fiancée, Mairi Malvina Mariota Maggie Murial Morven McKenzie," he introduced her to them. Huge grins came across Mr. and Mrs. Anderson’s faces. At the wedding, when the words were spoken, "Do you Angus Alan Alastair Alpin Andrew Alban Anderson take Mairi Malvina Mariota Maggie Murial Morven McKenzie to be your wife?" and "do you Mairi Malvina Mariota Maggie Murial Morven McKenzie take Angus Alan Alastair Alpin Andrew Alban Anderson to be your husband? I now pronounce you husband and wife." Mr. and Mrs. Anderson and Mr. and Mrs. McKenzie cried with joy. Mr. and Mrs. Anderson were so proud. Both their son and his new wife had such long, important and special names. A year later Angus Alan Alastair Alpin Andrew Alban and Mairi Malvina Mariota Maggie Murial Morven had twin babies, a boy and a girl. Mr. and Mrs. Anderson were so happy. They went right over to the hospital to see their new grandchildren. "Angus Alan Alastair Alpin Andrew Alban, I do hope you and Mairi Malvina Mariota Maggie Murial Morven are going to name your children long, important and special names," Mrs. Anderson suggested. "Oh we are," said Mairi Malvina Mariota Maggie Murial Morven, holding up her new baby girl. "This is Heather." "And this is Heath," said Angus Alan Alastair Alpin Andrew Alban, as he held up his new baby boy. He smiled at his wife, and they both felt proud.